2. Found only at our sister property, Pine Needles, a Golfari is a unique adventure that strikes the perfect balance between learning the game, playing the game and relaxing in the company of friends, old and new. Our Ladies Golfari is an unforgettable experience for women, by women and about women. On the Golfari, you’ll explore every aspect of your game – from driving to putting and everything in between – on one of the top four courses in North Carolina. And you’ll share every class, cocktail and meal with women who are as fun and adventurous as you are. Rates are based on double occupancy. Single rates available. Visit Accommodations for lodging options. Daily agenda available upon arrival. In the event of inclement weather, instruction will take place at Pine Needles’ state of the art indoor facilities. 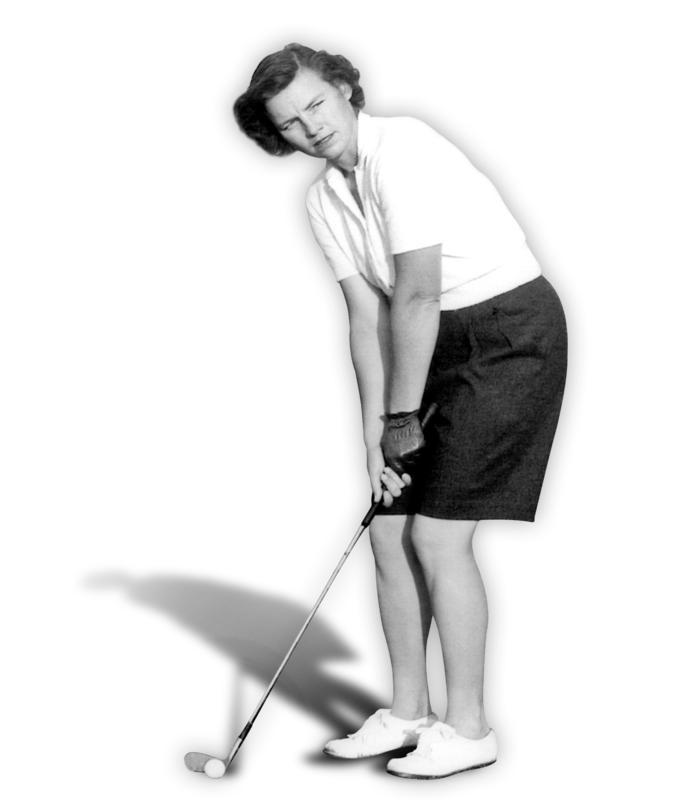 Founded by LPGA legend and charter member Peggy Kirk Bell, our Ladies Golfari is one of the most sought after golf instruction opportunities in the country. Designed by women for women, each Ladies Golfari offers a wonderful week of fun, relaxation and game improvement. Every day is filled with adventure, with instruction both on the lesson tee and on the golf course. 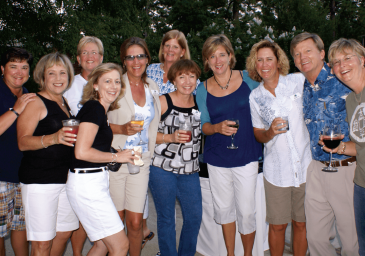 Off the course, Golfaris will enjoy evening entertainment, cocktail receptions and gourmet dinners. It’s the ultimate girls’ getaway! The fun doesn’t end when you put down your golf bag. Golfaris will enjoy delicious meals prepared by our culinary team, nightly entertainment and endless activities. Browse through the charming boutiques in the quaint Villages of Pinehurst and Southern Pines. Take a historic walking tour. Swim. Play tennis. Work out in our fitness center. Or just relax with a glass of wine and a book under the towering Longleaf pines. 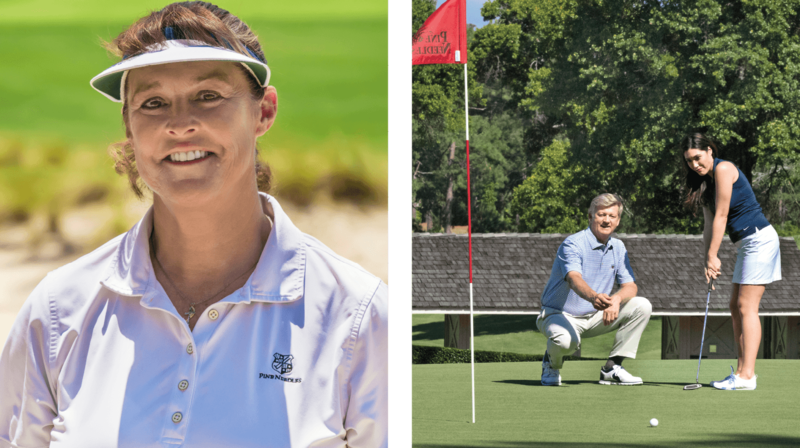 When you attend one of our Ladies’ Golfaris, you not only benefit from the instruction and traditions originated by Peggy Kirk Bell, you also learn from LPGA Major winner Donna Andrews and former PGA TOUR Rookie of the Year Pat McGowan. Our instructors love to teach. And our relaxed, “Ladies Only” environment is designed to make your learning experience as rewarding as possible. Whether you are a beginner or an experienced golfer, you’ll hit the ball straighter, master troublesome fairway woods, improve bunker shots and grow your love of the game. Our personalized approach to teaching will undoubtedly improve your game. Registration is from 9:00 a.m. to 12:00 p.m. on Monday. The Golfari officially begins with lunch at 11:45 a.m. followed by afternoon instruction and ends after lunch on the last day.